A great man and a great teammate. The above simple fact is unavoidable. 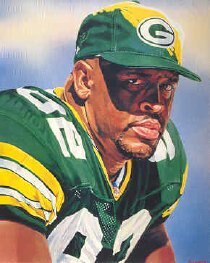 Reggie White is dead. It is not clear whether he died from a heart attack or from complications from sleep apnia. Either way - Reggie White is dead. In the next few days you will probably hear many testimonials on how great a man he was, how great a teammate he was, how great a man of faith he was and how great a family man he was. You will also hear some people say "yes he is dead but..."
These are the people who would like to call Reggie White a racist for a speech he gave in front of the Wisconsin legislature. These are the people that would have you believe that Reggie White was some sort of black, ecclesiastic, athletic David Duke. people who knew Reggie best will all say the same things, "he was a great man and a great teammate". Anyone who says otherwise deserves the title of ankle biter. Reggie White did so many great things to improve his community whether it was in Philadelphia, Green Bay or for a short time - Carolina. Let he who has done as much in his community come forth to cast the first stone. No takers on that? I didn't think so. Reggie White was a great defensive lineman who was perhaps the greatest sack artist in NFL history. Other players may have been greater on the field (see Jones, Deacon) but none combined the on the field and off the field value like Reggie White. If you see people painting Reggie White as a "religious zealot" or "homophobe' in your local paper - I suggest you cancel your subscription and instead send your money to any of the causes that Reggie White supported while he still had breath to breathe. The money will be better spent that way. My favorite Reggie White story is about how he was trying to decide where to go as a free agent. He said something to the effect that he was leaving it in God's hands. Taking the initiative, Green Bay coach Mike Holmgren called Reggie's answering machine and said "Reggie, this is God. I want you to play for the Packers." On the negative side of the ledger I must say that Reggie always said that he just wanted to follow God's calling. I don't think that God called Reggie to be dead at age 43. Let this fact resonate with people who maybe aren't eating right or exercising right. The age of 43 is too young for anyone to be taken from their family. The only silver lining to me is the fact that he didn't die on Christmas Day. You're right so many ways that it is hard to know where to begin. But the vultures will rank on White anyway. Any surprise that it was the New York Times that was first in line with the "yeah but he was a racist homophobe"? The NYT can't let a good Christian man go unpunished. But if it's any consolation, Reggie has gone home in the one way he never had before, and I like to think it was a gift. Life doesn't get easier for former NFL defensive tackles who played as long as he did, and his glory is fresh in our minds. God bless and see you on the other side, Reggie.